There are times when you need to know a dish is going to be terrific. When friends or family are visiting and I really want to put a delicious meal on the table with no uncertainty, I head for the Barefoot Contessa books. I’ve lost count of Ina’s recipes that have become my go-to’s because everyone always loves them. And, I’ve lost count of how many times I’ve made each of them. The Turkey Lasagna from Barefoot Contessa Family Style, the Cranberry Orange Scones from Barefoot Contessa at Home, the Crispy Mustard-Roasted Chicken from Barefoot Contessa Foolproof, and Roasted Tomato Basil Soup from The Barefoot Contessa Cookbook never fail to please. Needless to say, I’m a fan. I couldn’t wait for the latest book in the series, Make it Ahead , and I received a review copy. In this book, the recipes are true to Ina’s style as always, but for each, there are instructions for how to make and store things in advance. In some cases, part of a recipe can be started in advance, and in others the entire dish can be made ahead. I’ll be making the Make-Ahead Goat Cheese Mashed Potatoes for Thanksgiving, and I really want to try the Tomato Mozzarella Pan Bagnat that can be assembled in advance and grilled when ready to serve. The Wild Mushroom and Farro Soup would be great to have in the refrigerator during a chilly week, and I don’t think I can wait one more day before trying the Chocolate Cake with Mocha Frosting. Last weekend, I made ahead our entire Sunday brunch. It was a delight to have everything ready and to serve the meal so easily. I made the Mini Italian Frittatas which are rich with Fontina, half-and-half, and parmesan. They were baked in a muffin tin to create individual servings, and they reheated perfectly. I served the little frittatas with toasted Sour Cream Corn Bread which has become my new favorite thing to pop out of the toaster. I don’t think I’d ever made corn bread in a loaf pan, and I don’t recall ever toasting it. The loaves can be baked, cooled, and stored wrapped in plastic wrap in the refrigerator for up to four days. Or, they can be frozen for three months. When ready to serve, just cut thick slices and toast them. The recipe makes two loaves, so I have one stashed in the freezer for a later date. To start, the dry ingredients were whisked together including flour, cornmeal, sugar, and I used half the sugar to make it less sweet, baking powder, and salt. In a separate bowl, eggs, milk, and sour cream were whisked and melted butter was slowly added last. The wet ingredients were folded into the dry ingredients, and that was it. The loaves baked for about 40 minutes while puffing up and turning a pale golden color. I let the loaves cool, stored them away, and sliced pieces to toast just before brunch. The edges get toasty and crispy while the center of each thick piece remains tender. Salted, Irish butter was exactly right to spread on top. It’s nice to know I have another loaf ready and waiting whenever I need it. And, I like knowing I have this book for reliable, crowd-pleasing dishes that are perfect for entertaining. Reprinted from Make it Ahead: A Barefoot Contessa Cookbook . Copyright © 2014 by Ina Garten. Photographs © 2014 by Quentin Bacon. Published by Clarkson Potter, an imprint of Random House LLC. 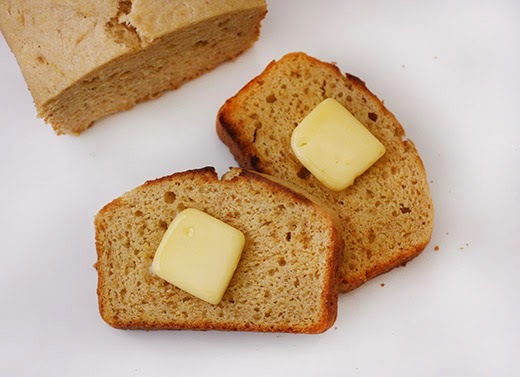 This all-American quick bread is usually served with dinner. To make it ahead, I bake it in loaves, and then slice, toast, and slather it with butter and jam for breakfast. Bob’s Red Mill cornmeal is widely available and essential for this recipe. Preheat the oven to 350 degrees. Grease and line the bottom of two 8½ × 4½ × 2-inch loaf pans with parchment paper. 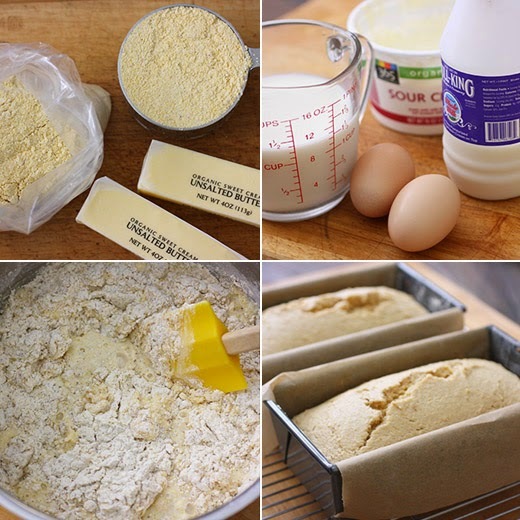 Whisk together the flour, cornmeal, sugar, baking powder, and salt in a large bowl. In a separate bowl, whisk together the milk, sour cream, and eggs and then slowly whisk in the melted butter. Pour the wet ingredients into the dry ones and mix them together with a rubber spatula, until combined. Don’t overmix! Pour the batter into the prepared pans, smooth the top, and bake for 35 to 40 minutes, until a toothpick comes out clean. Place the pans on a rack and cool completely. When ready to serve, slice the corn bread, toast it, and serve with salted butter and strawberry jam. Make It Ahead: Bake the corn breads, cool completely, wrap tightly, and refrigerate for up to 4 days or freeze for up to 3 months. Defrost, if necessary, slice 1/2 inch thick, and toast. This would be really nice with spinach soup I am going to prepare for the lunch. I just purchased Ina's latest but have not yet tried any of the recipes. This must change and soon! Especially with a fabulous cornbread recipe waiting to share with family and friends. Although I have made corn bread in a loaf pan, I usually use a skillet. Just because. ;-) And I've never made cornbread with sour cream. But I will -- really good recipe. Thanks. I hope you're well and that Thanksgiving treats you right. Yummy! 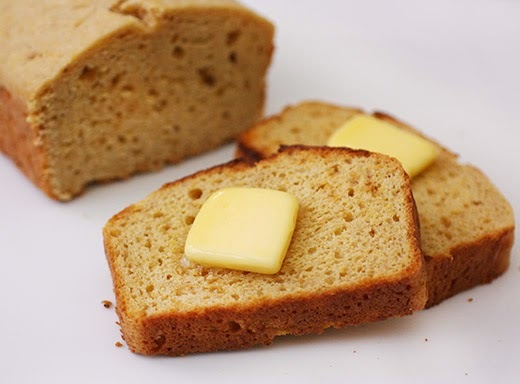 Your corn bread looks amazing! I totally love your recipe! Pleased to read all the Ina recipes you've been trying from her new book. I am giving it to my DIL for Christmas and snuck a look before I wrapped it. Naughty Barbara. :) It's exactly what we've come to expect from Ina...with the ease of making ahead. I've made cornbread in muffins, but never a loaf. Sour cream always makes such a difference in crumb. Love the way this looks, Lisa. I got her book as a Kindle version, but haven't tried anything yet. Her cooking is usually a bit too rich for my taste, but the fact that it was as a make-ahead approach, made me go for it. I've never thought of corn bread in a loaf pan either! But I'm certainly game. I use an old corn bread recipe of hers that was in a magazine eons ago...and never made it to a cookbook. I'm thinking this recipe is very close b/c of the amount of sugar. Looks delish! I have never made a corn bread and this recipe sounds perfect. Hi Lisa, I always go for Ina's recipes for something tried and true, they always turn out. Your bread looks fabulous, have this book on my list! I've never made corn bread in a loaf, love the idea! Pinning this one to try soon. Thanks Lisa. I've got to make a confession... I've never cooked from the barefoot contessa... Even worse, I don't have any of her books... I don't know why and looking at this corn bread I think I'm gonna have to rectify this issue... Looks delicious! This has to be some delicious cornbread! I love cornbread and I know with the sour cream addition and because it's Ina's that it's great, and probably doesn't crumble like so many. It's a keeper and looking forward to trying it. I like your blog! Pam, you're right. This isn't a crumbly corn bread. Thanks for visiting! I tend to make my cornbread in a cast-iron skillet but I think the loaf pan would be great when I make cornbread to be used for my Thanksgiving stuffing. Oh my! That recipe is just a breath of fresh air. I love the potentials for mixing that up with lots of other dishes and I'm sure it'll taste even more spectacular. I'm definitely whipping up a batch of my own. Thank you so much for sharing that lovely corn bread recipe! Happy baking!